Chelsea will play Manchester City in the Carabao Cup final after overcoming an aggregate deficit to beat Tottenham on penalties at Stamford Bridge. Trailing 1-0 from the first leg, Chelsea made a bright start and got their reward when a corner was cleared only as far as N'Golo Kante, whose daisy-cutter deflected off two Tottenham players, wrong-footing Paulo Gazzaniga and ending up in the back of the net. With Tottenham looking ragged in all departments, Chelsea took full advantage with a well-worked goal to take the aggregate lead. Cesar Azpilicueta laid the ball on a plate for Eden Hazard, who simply passed the ball into the corner of Gazzaniga's net. Mauricio Pochettino's half time team talk had an almost immediate impact as ​Tottenham restored aggregate parity within five minutes of the restart. Danny Rose's cross was in a good area for Fernando Llorente, who stooped to head the ball into the net. It was a much more even match thereafter, although the best chances were still falling to ​Chelsea. Olivier Giroud raced through on goal but fluffed his lines, and ​Hazard missed a couple of chances to get his second of the day, so it went to penalties. Both teams scored their first two penalties before Tottenham's Eric Dier blazed the ball over the crossbar and Jorginho gave Chelsea the advantage. Kepa's save from Lucas Moura gave the Blues match point, and David Luiz made no mistake, sending Chelsea to Wembley. Whether Chelsea's players were responding to Maurizio Sarri's stinging criticism after their defeat at Arsenal, or whether they were simply raising their game for a big semi-final, we don't know. But in the first half they produced exactly the kind of performance Sarri wanted to see. He questioned his players' mentality and motivation after that meek loss at the Emirates Stadium, but it was a completely different team which took to the field against Spurs. While Tottenham wilted under the pressure, Chelsea rose to the occasion, as they so often do in the cup competitions. 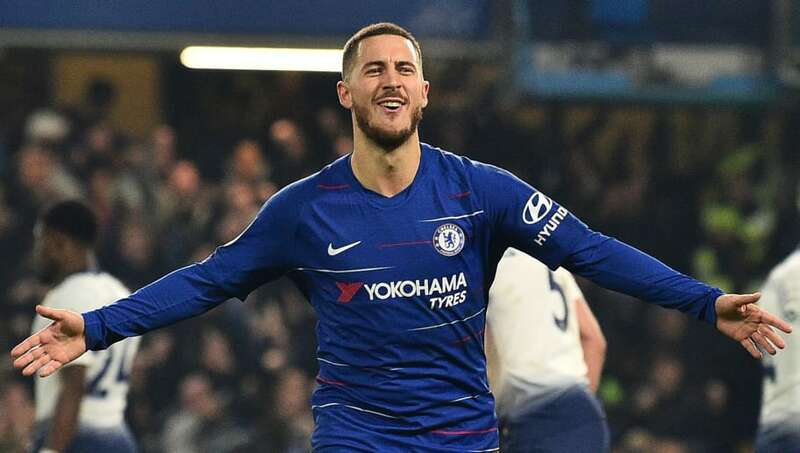 Sarri also said on Wednesday that Hazard is 'more of an individual player than a leader', but the Belgian led by example in this match, scoring his first goal of 2019 and posing a constant threat to Tottenham's beleaguered back line. They need him at his best for the rest of the season if they want to qualify for the Champions League. In a way, Chelsea's performance proved Sarri's criticism right. This squad has always had the ability to produce brilliant performances, it is only their ability to do so on a regular basis which is in question. They must be at their very best to stand any chance against Manchester City in the final. Obviously you could make a strong case for Hazard, but it was ​Kante who set the tempo with a dominant performance. He made Tottenham's midfielders look like schoolboys in the first half, and it was his goal which set Chelsea on their way. N'Golo Kante just nutmegged 3 people with one shot, and scored. Give the man the Ballon d'Or FFS. I’ll say it again about Kanté. He’s Chelsea’s best scoring midfielder right now. Miles ahead of Kova & Jorginho in that category and is hitting it WAY cleaner than Barkley these days. 4 - N’Golo Kante has scored four goals in 30 apps for Chelsea in all competitions this season – as many as he netted in his previous three seasons in England combined (4 in 129 apps). Upturn. ​Giroud had two really good chances to restore Chelsea's aggregate advantage, including one in the last minute, but he fluffed them both. Luckily it didn't prove decisive, but you can see why Gonzalo Higuain has been signed. With three talismanic forward players missing - ​Harry Kane and Dele Alli injured, Son Heung-min at the Asian Cup - Tottenham's night was always going to be about keeping it tight and taking their chances on the counter-attack. But the absence of those three players seemed to have had an effect on the whole team, at least in the first half. Tottenham were overrun in midfield, with Harry Winks, Moussa Sissoko and ​Dier all struggling against Chelsea's faster, stronger central trio. A big goal from @llorentefer19! As for the defence, even Toby Alderweireld and Jan Vertonghen looked shaky at times, with Alderweireld culpable for giving away the soft corner from which Chelsea took the lead - though he did make amends with some crucial interventions in the second half. So for all the praise that Pochettino deservedly receives, questions will continue to be asked about his ability to motivate his players for big matches. They have lost their last three semi-finals, and even with a first leg advantage they weren't able to see this one out. Brought on as a first-half replacement for Ben Davies, Rose was a constant nuisance for Chelsea. He produced the cross from which Llorente scored, and continued to cause Azpilicueta problems, with the Spaniard going in the book for taking out his opponent. Dier was well off the pace, particularly in the first half, and it was more by luck than judgement that he didn't end up in the referee's book. He then failed to hit the target with his penalty in the shootout - unforgivable. Both sides continue their quest to reach another Wembley final with FA Cup ties on Sunday. Chelsea host second-tier Sheffield Wednesday while Tottenham make the short trip to Crystal Palace. They return to league action the following Wednesday, with Tottenham hosting Crystal Palace and Chelsea travelling to Bournemouth.